In the last year, EVstudio has transitioned to its new location on 48th Avenue in Denver, Colorado. This places us across the street from Lakeside Amusement Park where we get to watch Cyclone run during the summer months. This has rekindled a question that I have had since I rode my first roller coaster; how do they work? 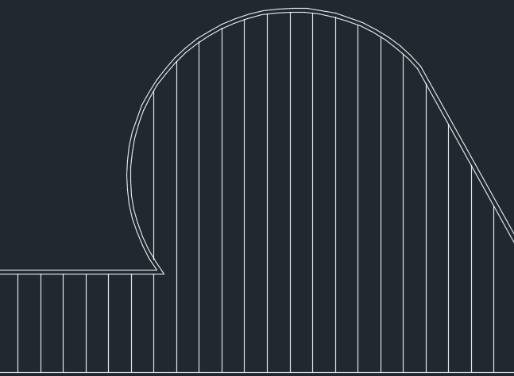 In this post I will be tackling one of the basics of roller coaster design; the shape of the track. 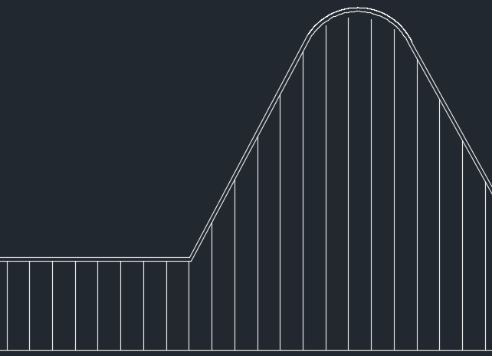 The beginning of the roller coaster is one of the most important parts. Yes, that long and slow trek to the top of the first hill has a purpose. A majority of coasters do not have any sort of propulsion system to keep the train at speed throughout the ride. The kinetic energy exerted throughout the ride is based upon the amount of potential energy stored on the first hill. For those of you who do not remember that 8:00 am lecture from your high school physics teacher; kinetic energy is the energy possessed by an object in motion and potential energy is the energy an object has because of its position relative to some other object. This means that the taller the hill and the steeper the slope the train travels down, the faster the train will travel. Next comes the transition from the adrenaline-filled nose dive to the rest of the ride. To avoid a fiery death, this transition should be done with a gradual concave curve. Borrowing the metaphor from one of my sources, think of the path a ball takes when thrown (Annenberg Foundation). A ball will fly through the air with a gentle arch, which is how we want our coaster; crazy fast, but gentle. If the train were to come across an angled portion of the track, it would be like running into a wall and if the track was rounded (a less gentle curve), the train could fly off the track. The last shape I would like to look at is the loop de loop. 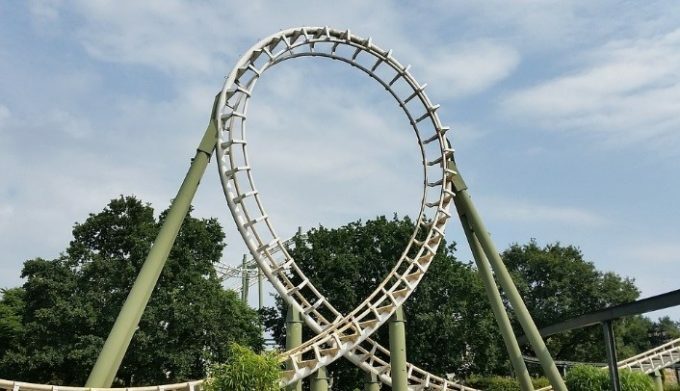 You may have noticed that any roller coaster loop is not perfectly circular, or you might not have because you were too busy screaming your head off as you were flipped upside down at high speeds. This is because a perfectly circular loop is very dangerous. Based on a great deal of some cool math, which you can see laid out on the DataGenetics website, one can determine how much force is exerted upon the human body. Spoiler alert! It is about 6g when speeding around a circular vertical loop. In case you were wondering, 5g is when the heart loses the ability to pump blood to your brain, and you go through oxygen starvation, that is a fancy term for blacking out. I do not know about you, but I prefer to be conscious for a roller coaster ride. By reducing the radius and elongating the circle, making an elliptical path, the g-force is reduced to a safe level that allows you to remain conscious for the rest of the exciting ride. Although EVstudio does not design roller coasters…we do have experience in a wide variety of projects across multiple disciplines. We strive to think outside the box, whether it be with abstract projects from clients or when our managers decide to see which of us can build the strongest table out of newspaper. Our fun team projects such as the newspaper table, peer reviews, and continuing education mean that EVstudio is always at the forefront of structural design. We may not design roller coasters now, but we have the drive and passion to put them within our reach.